I feel like I should start this with an entreaty to parents: This is a widely taught book, please don’t read it with your kid. Why not? Because often when students are familiar with the text and know the outcome, we teachers are limited in what we can do. A child that knows the ending can’t make predictions. A child who has read the words before with a grown-up may not stumble on something that they wouldn’t know in another context. A child who has discussed the theme before may be sharing ideas they’ve heard from you and not ones they’ve developed on their own. But then I feel guilty for trying to hoard books. So just consider yourself warned, Molly’s Pilgirm is frequently used in schools. It’s the kind of book that has a large number of teacher’s guides developed for it. In this book, Molly has moved first from Russia to a New York and now to a small town where there are no other Jewish girls and she is mocked for her accent and generally excluded by the other students. When Molly’s mother helps with her homework, the rest of the students become even more focused on their differences. However, Molly’s mother’s interpretation of what it means to be a Pilgrim helps show the class that even though much time has passed since the Pilgrims arrived on the Mayflower, people are still coming to the United States to seek religious freedom. Nu, Shaynkeit (say new shane-kite) – So, my beauty or So, my beautiful one. Nu, Malkelah (say new mal-ka-lah) – So little Molly. Oi, Malkaleh (say oy mal-ka-lah) – Oh little Molly. My mother-in-law also volunteered that it’s likely that Molly’s Hebrew name is Malka and the nickname is derived from that. Great for: Opening a unit on immigration and common themes for why people move. 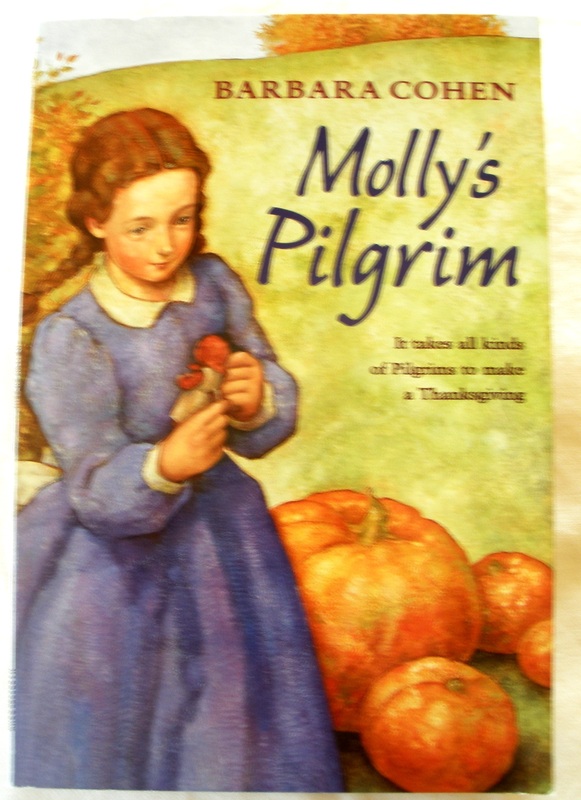 Molly’s mother makes the connection between the Pilgrims that came to this country and celebrated the first Thanksgiving and her family’s own flight from Russia in search of religious freedom. If you’re hoping to teach a unit where children explore the common reasons people emigrate and the common struggles they face, this will provide an excellent jumping off point. And teachers if you are looking to do such a unit, please stick around, I’ll be vetting lots of other books on immigration for you! Death, Violence and Gore – Molly’s family left Russia because the Cossacks (Russian soldiers) were burning down the synagogue and forcing the Jews out. This entry was posted in Primary Grades and tagged bullying, immigration, jewish. Bookmark the permalink. One of my favorite books for the classroom. I will hold off on reading it at home, because you’re right, Sadie is likely to encounter it at school one day.